Hi guys! It has been a minute since I blogged about mom stuff. Sorry. 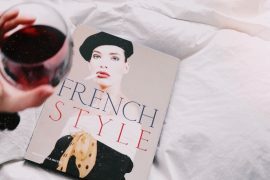 To be totally honest summer was insane and I defaulted to doing a ton of fashion posts because they are much easier for me. But, I want to get back on track and start doing more consistent parenting + home blog posts! It seems you guys are more interested in lifestyle stuff and also I really do love creating mom content. 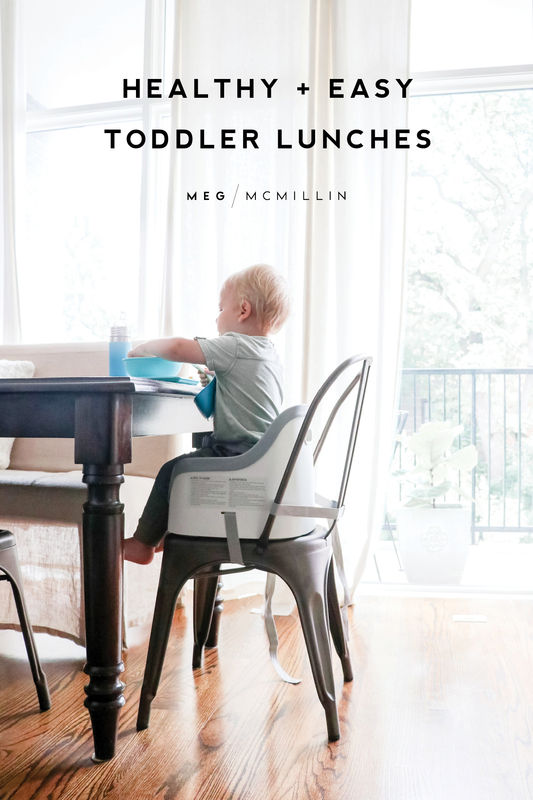 Today I’m sharing some go-to lunch ideas that are currently in James’ weekly rotation, along with 10 things I swear by for mealtime from buybuy BABY. 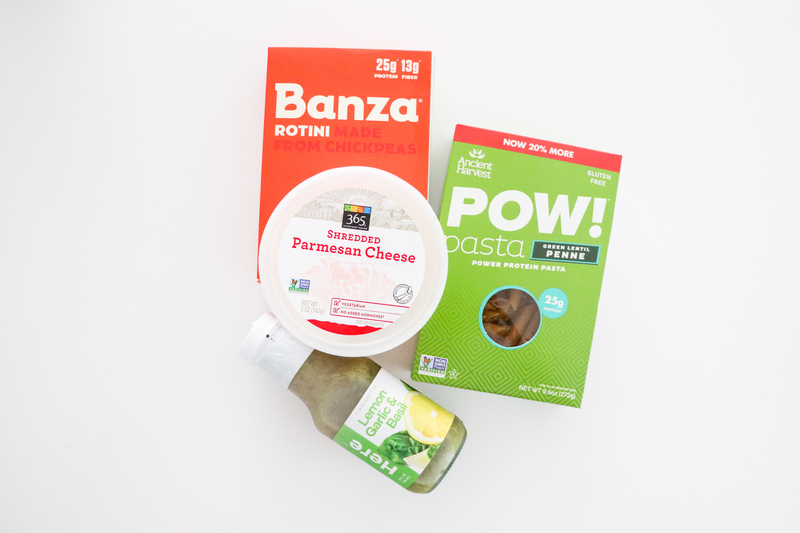 I’m excited to tell you about what products we love and why when it comes to eating, drinking, snacking, and so on! We just got this last week and James is so obsessed with sitting in it. I was nervous about it fitting securely on our smaller stainless steel bistro dining chairs but it fits perfectly + is so sturdy! I am happy but sad to report we no longer have a high chair in our house, James is officially turning into a big boy. We were torn between the Oxo Tot Nest Booster and the Peg Perego Rialto Booster Chair so we asked one of the helpful BBB employees and he told us that while both are awesome, he recommends the Oxo Tot for bigger toddlers that don’t need the tray or much height adjustment. 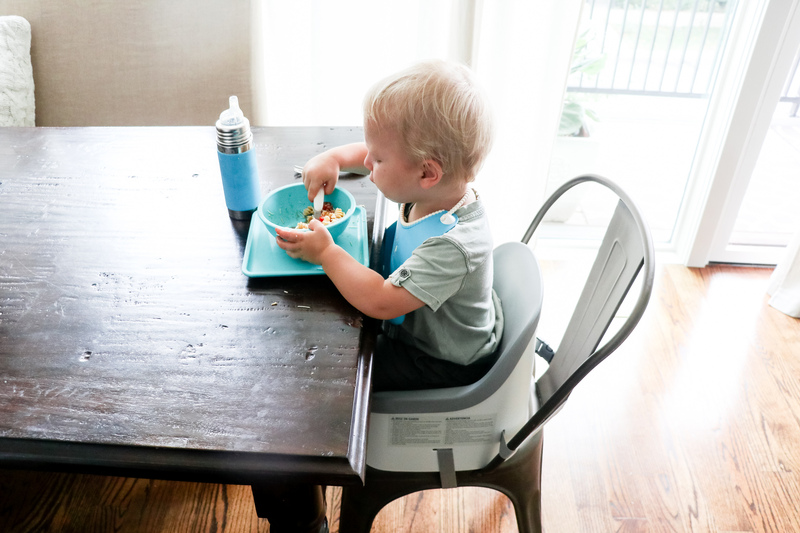 The Peg Perego is more of a table highchair and looking back I wish we got that when James was younger instead of having a highchair take up space in our small condo! 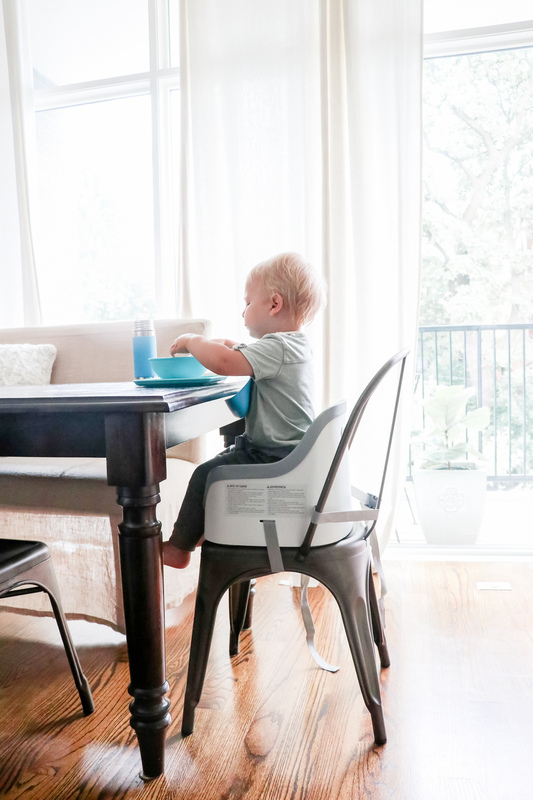 I can’t stress enough how much we love/use our countertop high chair! It is portable and easy to clean so we often bring it with us when we travel. We have 3 of these! All with the sippy cap top, not straw. First of all they contain no plastic whatsoever, only stainless steel + silicone which makes them super non-toxic. Secondly, they keep everything super cold! There is nothing worse than finding a whole sip cup full of old smelly milk left out from 4 hours ago. I have recommended this bottle to everyone I know! LOVE the 360 sippy cups as well! Great to toss in your purse without having to worry about spills or leakage. 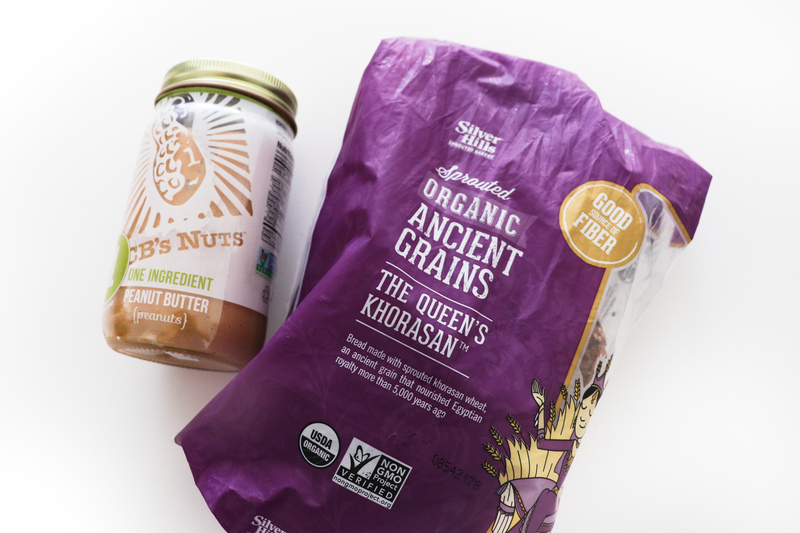 We have been using these ever since James started eating solid foods! They make for such an easy clean up. James has recently become obsessed with knives (praying this is normal lol) so I went out of my way to find some cutlery that had a kid friendly knife in the set to get him his fix! We also have the OXO Tot On the Go Fork and Spoon Set which is what he learned his fork/spoon skills with. The wide grips make it very easy for toddlers! I love the quality of these bowls and plates and they are dishwasher safe! I let James pick out his own colors at BUYBUY Baby and he was very excited about them. 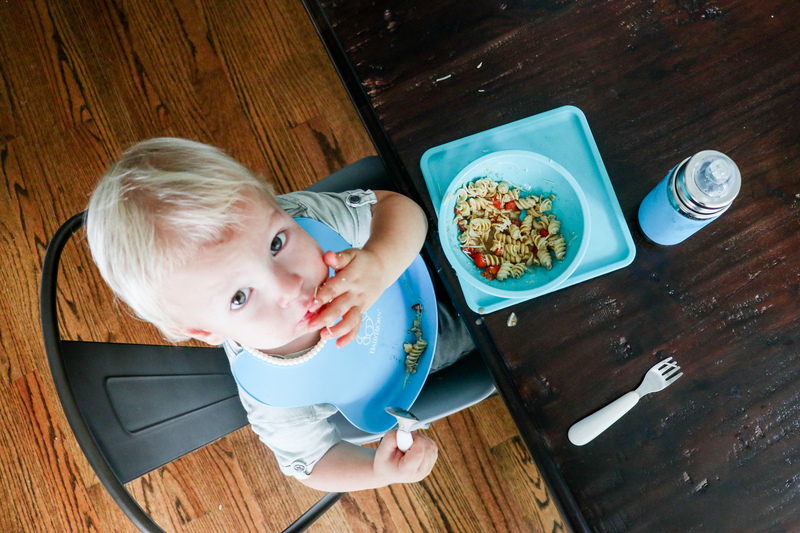 Okay, so we used the Oxo Tot catch-all bib for the longest time and it was great but I just recently switched to the Baby Bjorn and I like it more for one reason only: easier to clean. The whole bib is made of plastic (unlike the Oxo Tot which had a fabric neckline that took longer to dry) so I can do a quick and easy rinse off and it’s ready to go again right away. If you follow me on Instagram, you probably know that James and I are quite avid smoothie makers. It is something we do together almost daily after he wakes up from his nap. Well, we just recently decided to enter the 21st century and trade in our old basic blender for a NutriBullet and it is life changing. 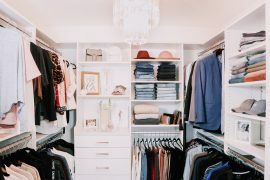 So much easier to use, clean, and store! James calls anything he eats out of this a “monkey snack”. These are such a must when you’re on the go! Also, the flexible opening stops snacks from spilling out and also slows down a hangry toddler. James is SO HEAVY and holding him up to the kitchen sink to wash his hands before mealtime is getting too difficult! We are in desperate need of a step stool but most of them seem too short. This Little Partners Step Stool is adjustable and seems like it would actually raise him up high enough to reach our kitchen sink. I think we are going to give it a shot and I’ll be sure to report back to you guys! Let me know if you have any feedback on this. I have always been a little bit uptight about what I feed James at home. I am much more lenient when we are out (he is very familiar with french fries, pizza, and the like) and I promise I’m not one of those crazy moms that sends a note with dietary restrictions to playdates. However, I am doing my best to apply my eating philosophy to James which is basically: create healthy eating habits at home + live your life when you’re out. I want to note that James is not a vegetarian, lol. He eats meat at dinner all the time! 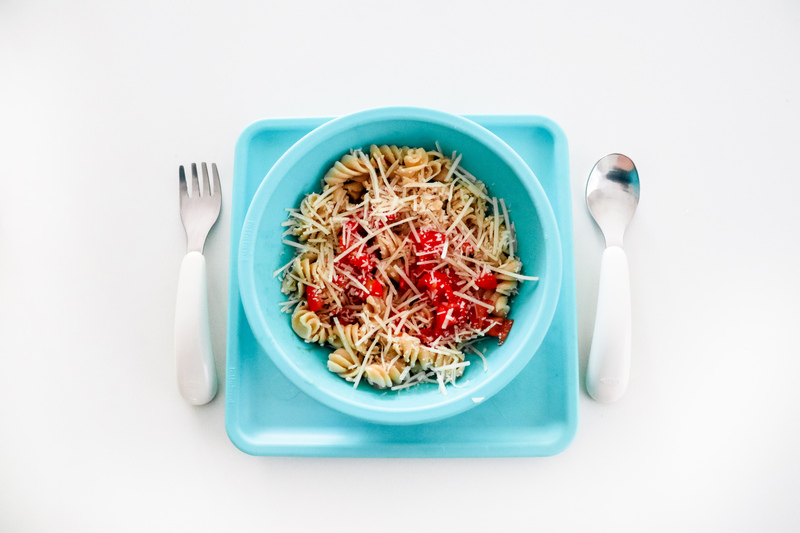 I like to keep lunches quick and easy and I don’t like to give him frozen meat so lunches are typically meatless unless we are doing leftovers from the night before! **I’m not sponsored by any of the food brands I’m linking below, I just love and use them regularly! Make a big batch of this at the beginning of the week so you have lunch already made for a good portion of the week! It refrigerates really well and I serve it cold to James anyway. Make enough for yourself because it’s good and so healthy. 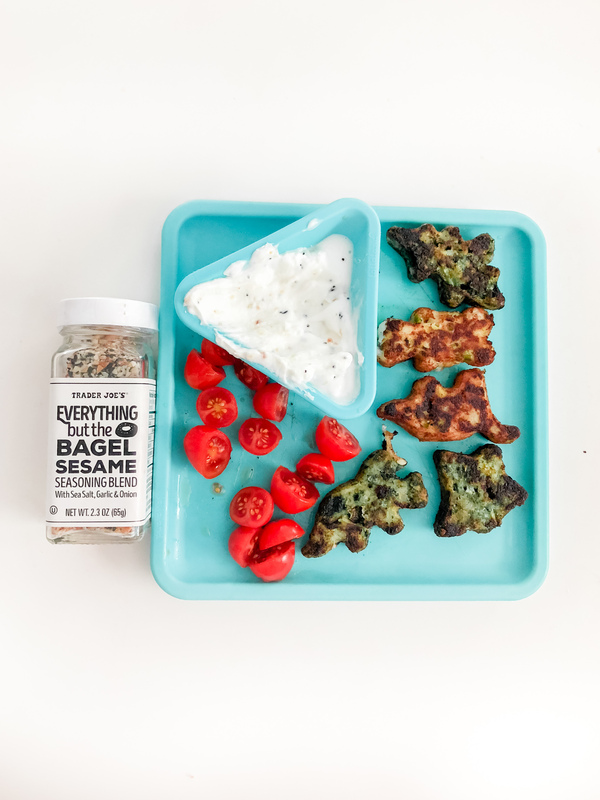 Mix the everything bagel seasoning into the Greek Yogurt for an amazing dipping sauce! Also, the Dr. Praeger’s veggie burger patties are DELICIOUS and I devour those for lunch sometimes myself. 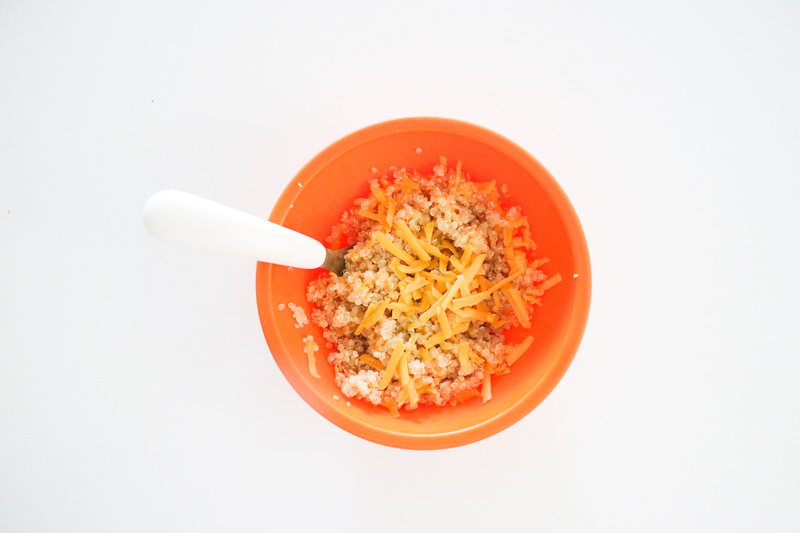 Make a big batch of plain quinoa at the beginning of the week. Then, melt cheese on a bowl of it at lunch time! Also, make a bowl for yourself and add hot sauce to it – preferably Cholula, for obvious reasons. 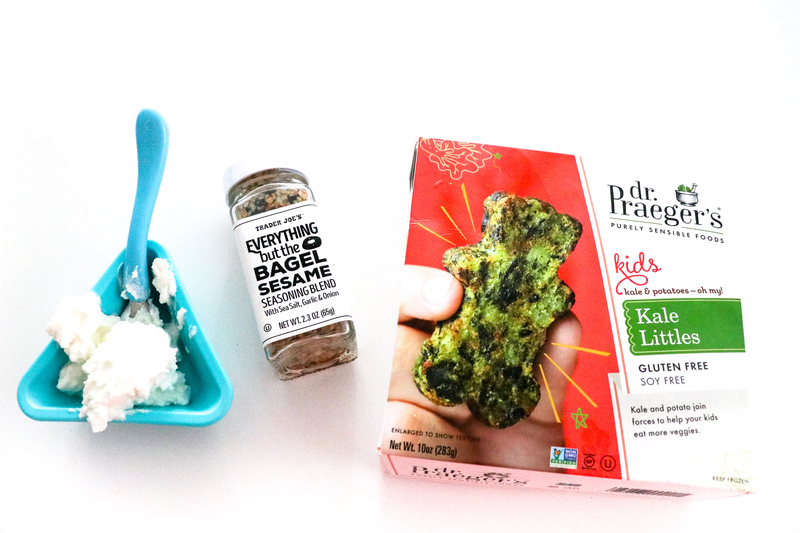 James would eat a piece of cardboard if it had cheese sprinkled on top (he gets his cheese addiction from me) but if this isn’t enough flavor for your little one try adding a little dressing to it! 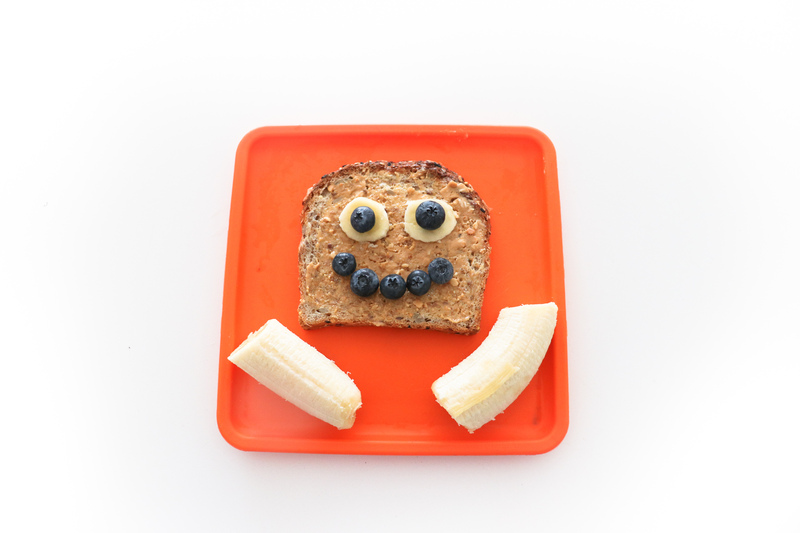 I know this is the most basic thing ever and I’m sure you don’t need to read a blog post to know to give your toddler a PEANUT BUTTER SANDWICH; but I actually didn’t think to do this until I saw it on Pinterest! Aww what a cute idea! !